Just as Uber has disrupted the taxi industry and Airbnb has impacted on the accommodation sector, retail is facing its own disruptions. Last year, we saw the collapse of many leading retail brands and this instability in the retail landscape appears to be continuing in 2018. In a period of increased competition, rising business costs and the entry of international players, small business has no choice but to adapt to survive. 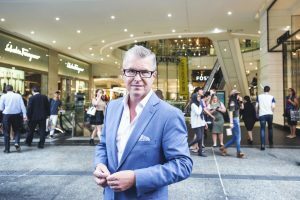 These are the thoughts of retail expert Dr Gary Mortimer, one of the keynote speakers who will share his insight into emerging retail trends at the Sunshine Coast Business Council’s Retail Evolution Conference on 30 May. QUT’s Dr Gary Mortimer from the School of Advertising, Marketing and Public Relations. Photo:QUT Marketing and Communication / Erika Fish. Dr Mortimer, an Associate Professor at Queensland University of Technology, is an active researcher in the areas of food retailing, retail operations and shopping behaviour and will detail his findings to help local retailers make smart and strategic decisions to secure their future. He believes the customer experience is more important today than ever before. “When you can buy almost anything you want, at any time, though multiple channels, creating a positive and more importantly, relevant experience is vital. Retailers are really looking to customer experience as their point of difference,” Mortimer says. Dr Mortimer also stresses that while physical retail will one day look very different to what we have today, it will never disappear completely. “Last year, commentary about Amazon’s entry into the Australian market was very much alarmist,” he says. Mortimer says our future customers are not even shopping with retailers yet, with the majority still at school or entering university. “Don’t bother about Gen-Y as they’ve already established relationships with brands. Retail businesses need to focus on Gen-Z,” Mortimer says. Sunshine Coast Business Council Chair Sandy Zubrinich says Dr Mortimer will be just one of a stellar line-up of retail experts sharing current trends and essential information for those looking to remain competitive in a rapidly changing retail environment. “We have brought together a group of excellent speakers who will provide their views on what is driving the evolution of the retail industry – a sector that is undoubtedly very driven by technology,” Zubrinich says. Speakers at the conference include Gary Horwitz, Managing Director Retail and Investment Management for Lendlease, who will share his thoughts into the future of bricks-and-mortar retailing; Martin Lakos, Divisional Director of Macquarie Wealth Management; Jonathon Ingle, Manager at EY Advisory who will discuss digital disruption, transformation and the customer experience; and local Michael Shadforth, Managing Director of Ray White North Coast Central, who will provide insight into the retail industry on the Sunshine Coast. The Sunshine Coast Business Council is the leading regional business advocacy group on the Sunshine Coast. It represents approximately 4,000 businesses through its membership, which includes key national and regional industry groups and their members as well as national and regional businesses.